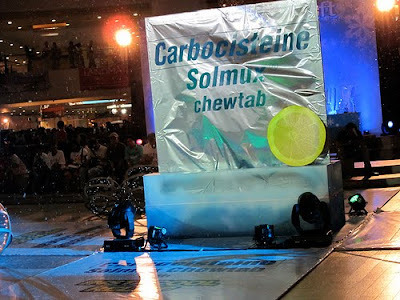 Trinoma witnessed the unveiling of the newest and coolest cough relief in town - Solmux Chewtab! Last December 4, 2009, over a hundred mall-goers danced to instacool songs as they opened a giant box to reveal the latest innovation from Solmux. The event was even more festive as snow fell on those who passed by the area. Truly, it was an instacool experience similar to the relief given by Solmux Chewtab! New Solmux Chewtab is the first chewable cough remedy available in the market. It is specifically designed for people on the go. Unlike other cough products, it provides instacool relief that you can immediately feel. It comes in citrus flavor with a cool menthol twist. It is handy and convenient; you don't need to take water, you just need to chew it. And since it's from the no.1 cough brand Solmux, you know it really works for cough with phlegm. Choose to get relief now with Solmux Chewtab.